Scholarship Support is an important way to serve our members! Scholarships are available to qualified candidates for different areas in the Aloha Chapter. 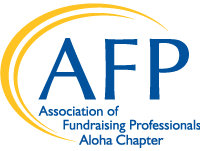 Each year, the AFP Aloha Chapter Board dedicates a portion of its budget to helping its members gain additional skills or access to expertise, to improve ethical and effective fundraising. Scholarships can range from stipends to assist outer island members with travel costs to attend seminars or conferences on Oahu to awards that cover fees for Fundamentals or CFRE courses. The Aloha Chapter also administers the Chamberlain Scholarship, which provides awards to Fundraising Professionals attending the National Conference for the first time. AFP Foundation Chamberlain Scholarship Program – The program is now closed. Congratulations to Gayle Hubbard, our Chamberlain Scholar!